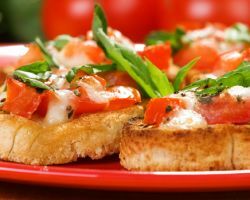 Serving Italian-American cuisine in a buffet style, Broadway Catering has become known throughout New York for their high-class catering service. When you first hire them to cater your event you will be in contact with one of their catering specialists. You will have the expertise of someone who understand the cooking process, presentation and world-class service. Broadway Catering love to cater for special occasions and it doesn’t matter to them if you only have close friends and family attending or your whole neighborhood, they will accommodate any number. Chef Noah’s restaurant is so successful that he decided to extend his skills to catering in Long Island, NY. 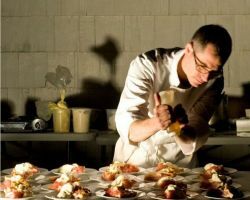 This extremely talented chef and his team of culinary experts are ready to travel to your specially chosen venue or invite you to use their restaurant for your wedding dinner location. They have extensive experience in catering for a wide variety of events so they will be able to match the style of your wedding with ease. The menu is locally inspired and will reflect any couple that grew up in Long Island. For genuine Italian catering there is no better place than Sebastiano’s. The chef himself, Sebastiano LoCurto, emigrated from Sicily where he had grown up watching his mamma and nonna cook incredible homemade food from scratch. Over the twenty years he has been catering he has always insisted on using the freshest ingredients so his clients get the best possible quality every time. Whether you would like a delicious corporate lunch, a party finger food platter or a full service wedding dinner, Sebastiano’s is your ideal caterer. Wedding catering companies in Long Island, NY, have the tendency to try and cover all bases. The menus of these caterers become so long that is difficult to find your favorites. Whole Le Crepe only specializes in one thing: crepes and they do them perfectly. 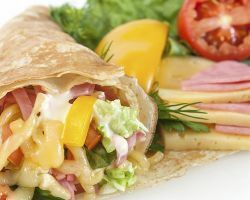 Their food truck style is ideal for a unique wedding style with a delicious range of both sweet and savory crepes, including their famous breakfast crepes. 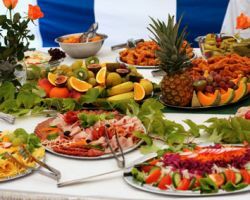 While they do not supply cheap wedding food, their service is much more affordable than most and they make great local caterers.